Before we had kids, hubs and I used to host dinner parties pretty often; not monthly, but probably at least every couple of months, we'd have people over for a nice fancy dinner party. Since we and others we know have started having babies, that has fallen a bit to the wayside; part of it is that I'm a little too tired and short on time to host, part of it is that my dinner parties don't tend to be so kid-friendly. Now, it's not that I think kids won't eat the food, it's just that the timing of a four-five course meal is not a reasonable amount of time for a kid to sit still or keep out of trouble (Z would happily gobble all of this food), and they tend to go too late for kids. Anyway, my solution is that I invite people over close to bedtime, so Lil Z and Lil R can charm my guests for an hour (okay, maybe they just annoy them, lol), partake in appetizers (only Z; R is too little! ), and then be whisked off to bed. And this time, I was extra excited, because I wasn't navigating a long list of food restrictions. I've posted in my Dinner Party 101 series before that catering to your guests is key to having a good dinner party, and I do maintain that stance BUT it's always nice when the guests just come with an enthusiasm for food in general. :) And wine, but we'll get to that later. So going back to how I plan a party (and I'm going to apologize in advance for the shoddy quality/quantity of the photos; I was having too much fun and kept forgetting, and then I maybe had too much wine and lost most of my ability to photograph. These pics are so terrible, I'm not sure they add anything to the post, but hey, it's what I've got. 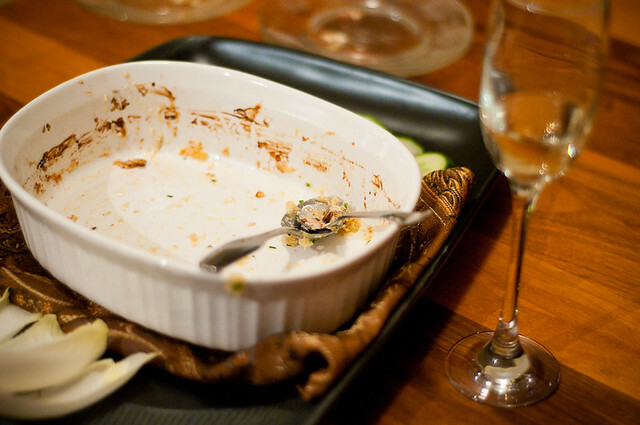 I don't have a photo of the actual caramelized onion, bacon and gruyère dip, but this is what the dish looked like at the end. I think it speaks for itself. For me, the key to having fun and relaxing and enjoying is that I like to have pretty much everything done in advance. I don't want to be fussing over things while all the fun happens out in the dining room. So I don't tend to serve things like seared scallops, risotto, etc., that require too much last minute energy. Here's my menu - and I'll go into the how-to in a minute. The recipes without a link (i.e., the original ones) are posted at the bottom of this post. I'm not gonna lie, it was pretty darn good. So what I do with a menu like this is that I break it down into components, and I write myself a schedule for those components, and cross things off my list as I go. See? Not so hard when you break it down. 8:15 - mussels served with bread. and more drinks. 8:45 - prep salad (assemble components, drizzle dressing). Check temperature of pork (needs to register 145F in the thickest part; use the oven timer and just check every 10 minutes. Remove from oven and let it rest once it gets to the right temperature). About 5 minutes in the kitchen. Serve salad. With more drinks. 9:15 - While pork is resting, reheat the celery root in the microwave. 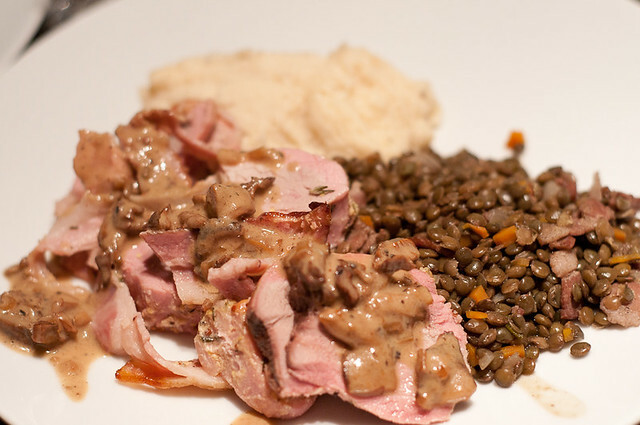 Slice pork and serve with sauce (takes 2 seconds on the stove to reheat), celery and lentils. About 5 minutes in the kitchen. And more drinks. whenever seems appropriate - serve dessert with coffee and digestifs, if desired. We served dessert at 1 am. 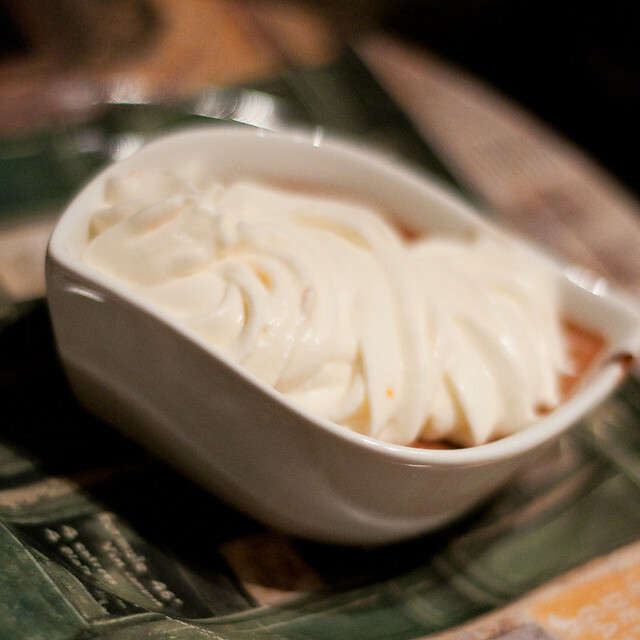 ;) Pots de crème (or any other custard-type dessert) is great because you just take it out of the fridge and top it with whipped cream. Again, only about 5 minutes in the kitchen. They are yummy, but this photo is so blurry, you can barely tell what it is! When we have dinner parties, I'm in charge of food, and hubs is in charge of drinks; i.e., keeping the water pitcher filled, and keeping the wine flowing (and possibly policing if someone is driving, but thankfully our guests cabbed it so we didn't have to worry about that). This division of labour works well for us, because it means that one person isn't constantly in the kitchen; you alternate a bit. Anyway, I will say that a great time was had by all, and leave you with the wisdom that while it might SEEM like a good idea to stay up and drink wine until 3:30 am, it seems like a much less good idea at 7 am when the kids are up for the day. 1. Whisk together olive oil, mustards, sugar, bbq sauce, garlic, and spices. 2. On a platter/cutting board, arrange the bacon so there are 2 sets of 7 slices side-by-side, to wrap around your pork. 3. 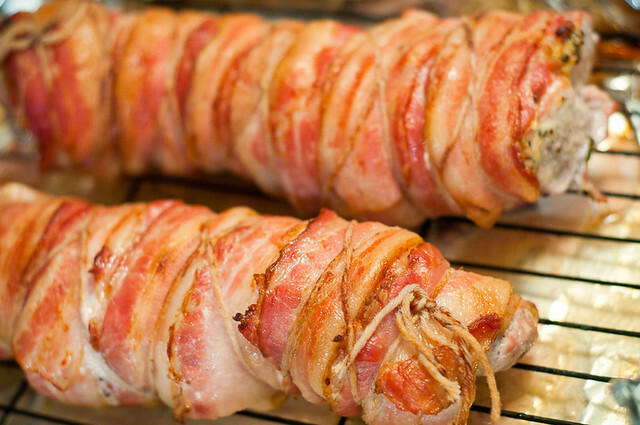 Place a tenderloin on in the middle of the bacon (so the slices can wrap around the pork). Smear half of the olive oil/mustard mixture on each pork tenderloin (while it's on the bacon). 4. 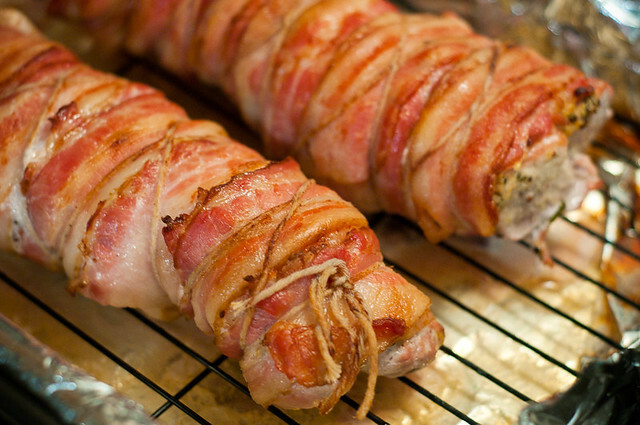 Wrap the bacon around the pork, and then secure with kitchen twine. You could probably also just cook it seam side down if you didn't have kitchen twine. 5. Let marinate for a few hours. 7. Cook for about 35-45 minutes, until the thickest part of the pork measures at least 145F (you can go as high as 160F and it will still be pretty moist). Let rest for at least 10 minutes. Remove twine, slice and serve. 1. Reconstitute the mushrooms in the boiling water (you may need more than 1 cup; this is fine). Let them soak for about 15-20 minutes. Strain, but keep the soaking liquid. Chop the mushrooms. 2. Heat a pot over medium-high heat. Add butter, and before the butter burns (but after it browns), add shallots. Sauté for 2-3 minutes. Add chopped mushrooms, saute until most of the liquid is out of the mushrooms and things are starting to stick/brown a bit. Add the sherry/marsala. Let it reduce until it's almost evaporated. Add the soaking liquid. Turn heat to high. Once the liquid has reduced to about half of what it was, add a ton of fresh-ground pepper, and the whipping cream. Keep the heat high until the liquid is reduced to about 1/4 of what it was before, and it nice and thick. The key to a recipe like this is having the patience to wait until the liquids thicken. It takes forever, so I like to do it in advance. The result is a rich, creamy, concentrated sauce and this particular sauce is delicious on almost anything - mashed potatoes, chicken, steak, pork, rice, etc. It's yummy, and it's also vegetarian and gluten-free. I make this up in advance and just reheat before serving. Thanks for reading and sorry for the shoddy pics. Maybe next time, a little less wine and a little more focus, huh? I made the pork tenderloin and mushroom sauce and they are fantastic! The mushroom sauce is out of this world! Thanks!